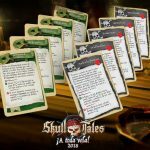 Skull Tales: Full Sail! 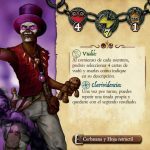 published by Eclipse Editorial, created by David Illescas, illustrated by Roberto Picó and Francisco Arenas and designed by Jaime González, is a semi-cooperative pirate adventure game for one to five players. 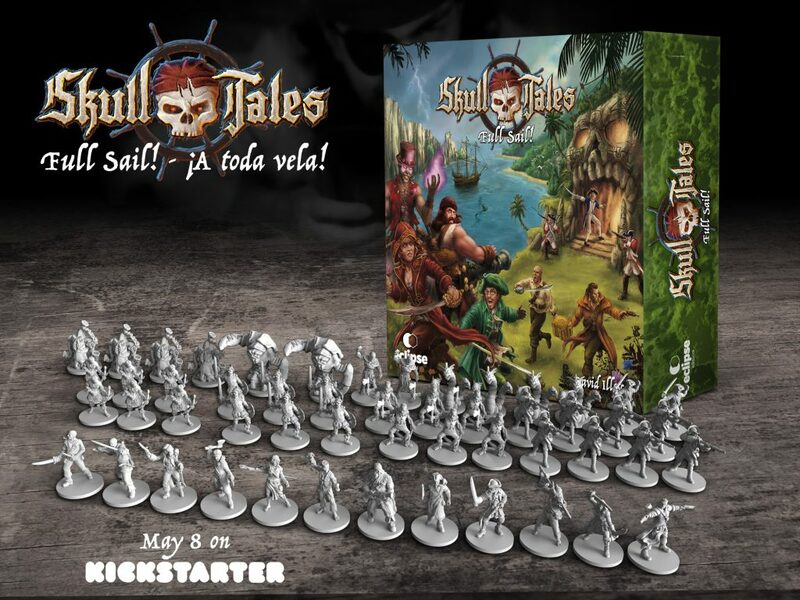 In Skull Tales you become a pirate hunting for fame and fortune as a member of the ‘The Southern Lady’ crew, dreaded throughout the Caribbean. 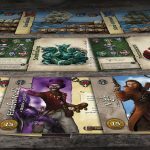 Full of dangers and monsters, the high seas also offer incredible opportunities for those pirates reckless enough to take the risk! 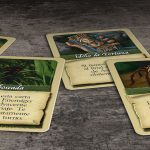 Your character is graphically represented on a beautifully drawn card as well as by a miniature which you’ll use on the different boards. 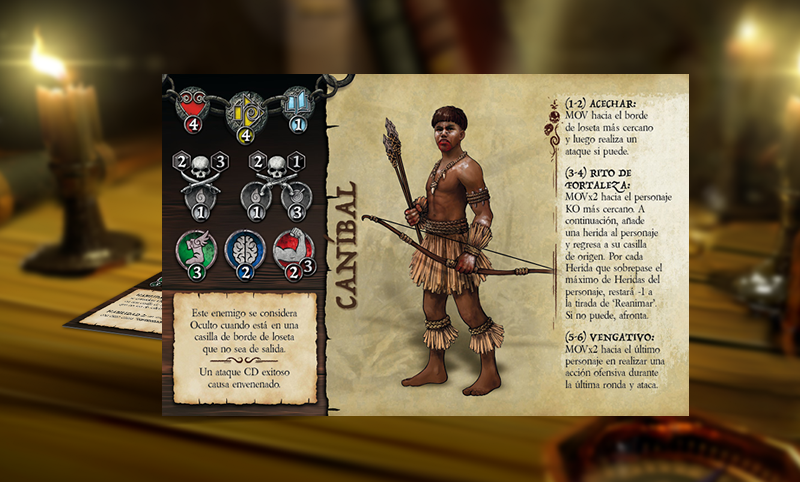 The card portrays your character attributes (agility, strength, intelligence, perception and charisma) in addition to life and action points. Also present is the basic equipment provided to you when you first set off on your voyage. 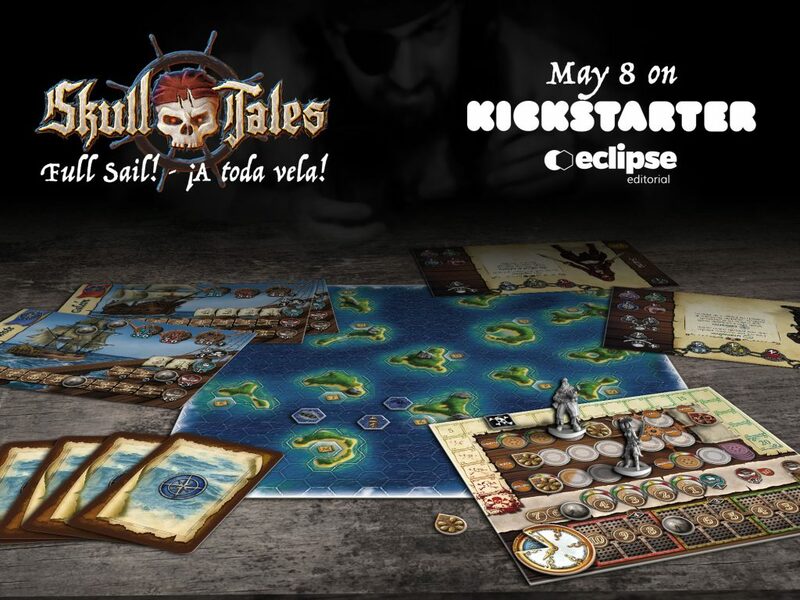 One way to enjoy Skull Tales: Full Sail! 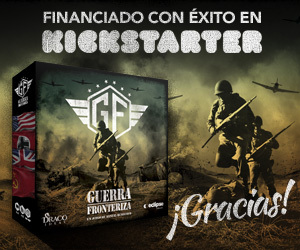 is by playing any of the campaigns. 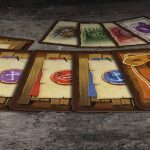 These are essentially a set of linked scenarios, complete with captivating narration, that vividly tell a story. 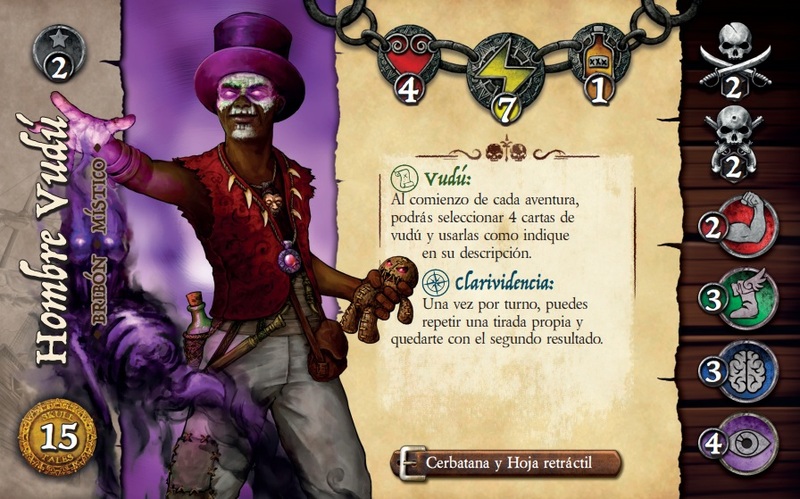 You can also choose to play a single scenario independently. 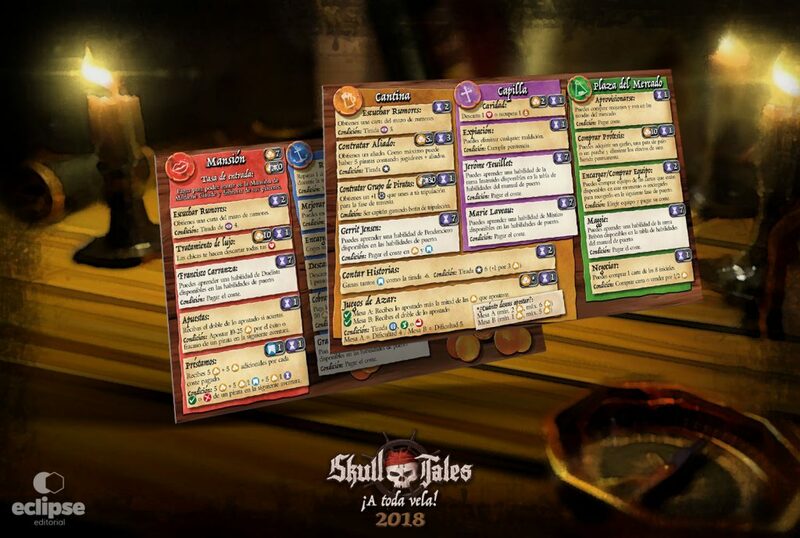 Skull Tales adventures are divided into three different Phases with mechanics and components of their own. The Adventure Phase comes first, then the Voyage Phase, and last but certainly not least the Port Phase. 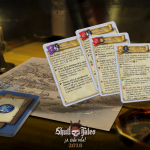 In Campaign Mode, the game length ranges from 60 minutes for a single scenario to over 150 minutes for a full chapter (Adventure, Voyage, and Port phases). 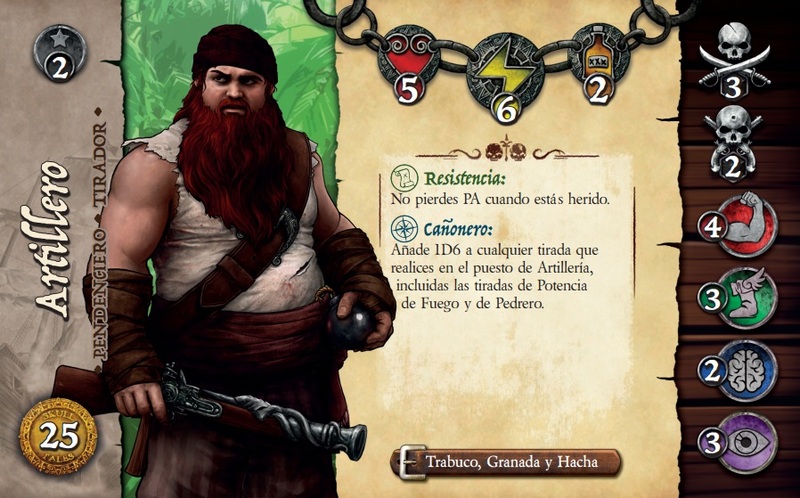 During the Adventure phase, you will explore mysterious islands, dangerous caves, forsaken temples, and pillage colonial villas. Awaiting you are amazing treasures and legendary artifacts that no man has ever laid eyes on. 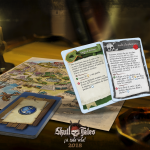 You will use terrain tiles that are drawn at random from the tiles listed in the scenario instructions.This ensures that every game you play is different. 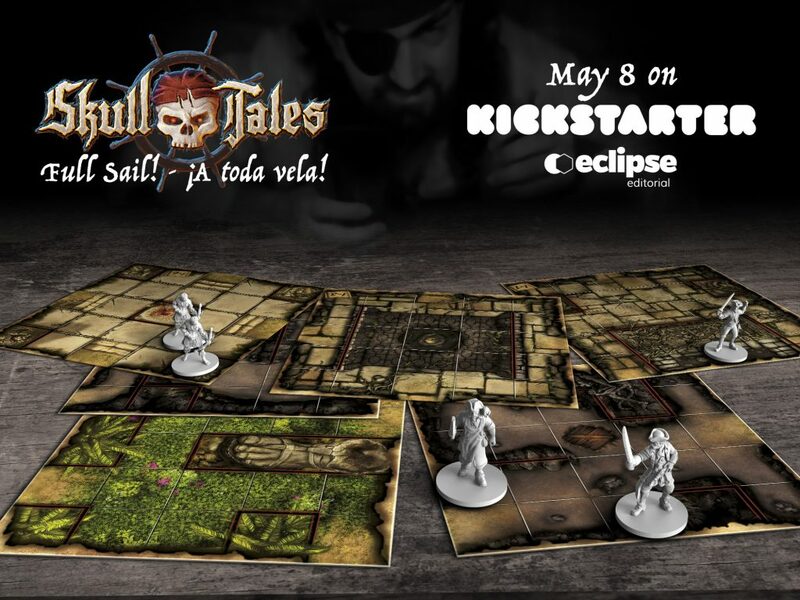 These tiles and the use of miniatures bring a tactical component to the game. 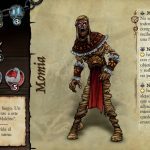 Attacks can be ranged or hand-to-hand, and your character can be stunned or knocked down. 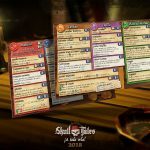 Also, you will roll skill checks against opponents and in different situations.With such a wide range of options available, every adventure becomes an experience that is both challenging and highly entertaining! 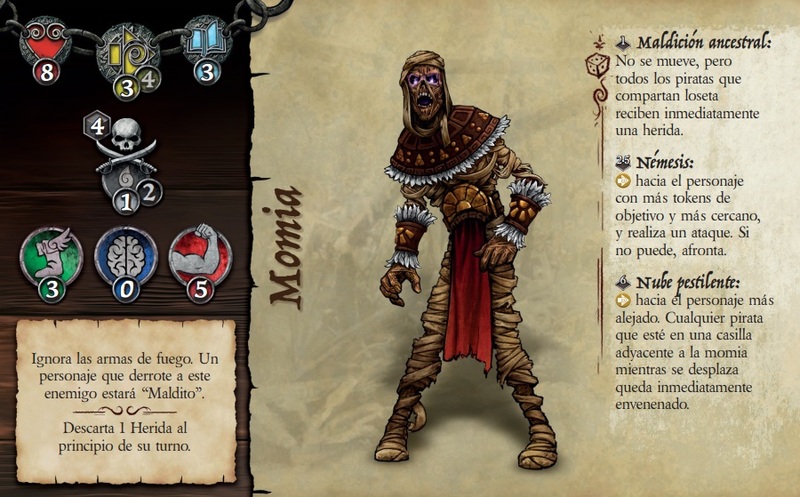 You will come up against dangerous red coats and their officers and cross swords with conquistador skeletons all while trying to evade curses from Mayan mummies. 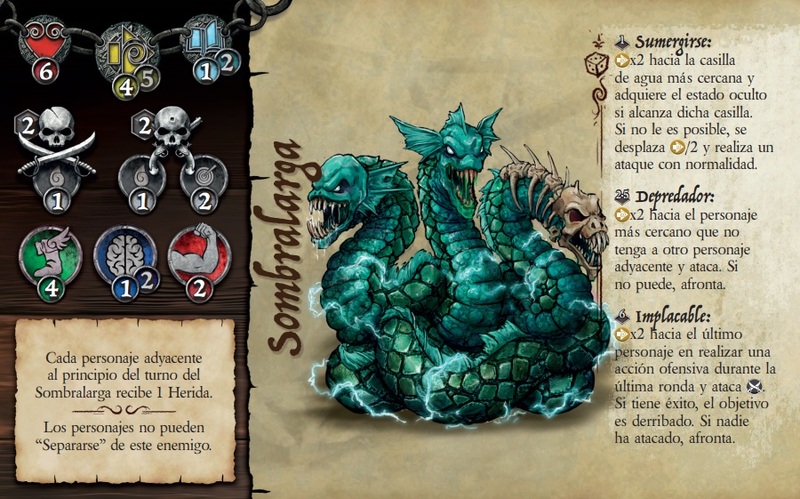 And as if that weren’t enough, you’ll fight the mighty Darkclaw and his abominations ruled by Yemayá, Goddess of the Sea. 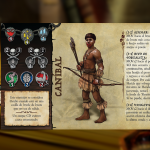 All these enemies are also represented by detailed miniatures and have their own card with attributes and behaviours. 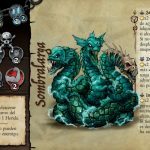 For this reason, in Skull Tales, you don’t need a player to lead the enemies. 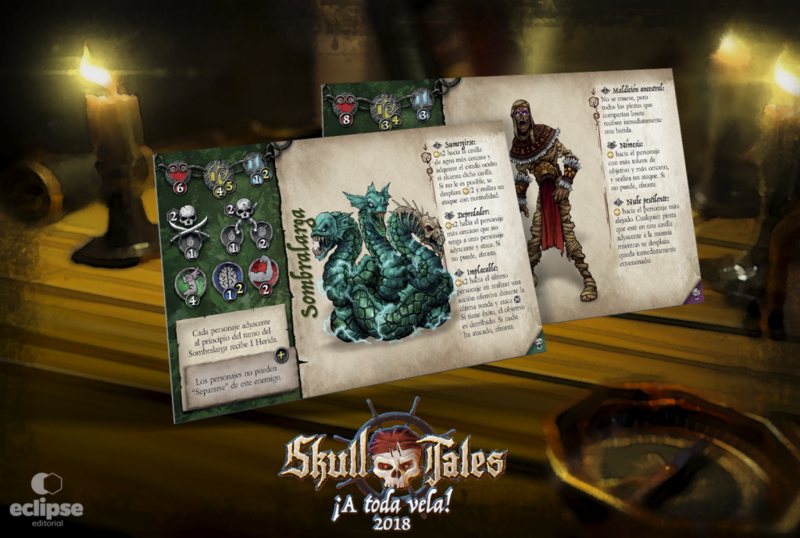 Each opponent has a table with different actions that are carried out depending on dice rolls, making their behaviour unpredictable. 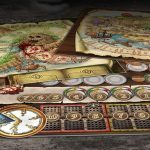 In the Voyage Phase, you will form part of the crew of ‘The Southern Lady’ sailing the menacing seas of the Caribbean in search of valuable cargo. 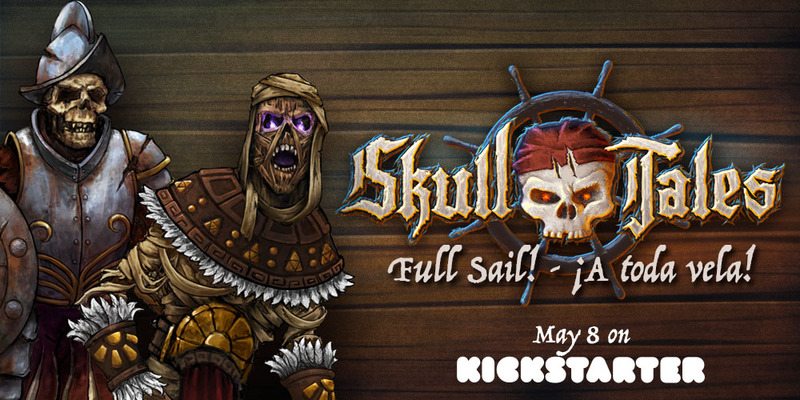 You will board ships and face the most-feared creatures of the seven seas. But, keep an eye on your fellow crewmates when it comes time to mutiny and name a new Captain. 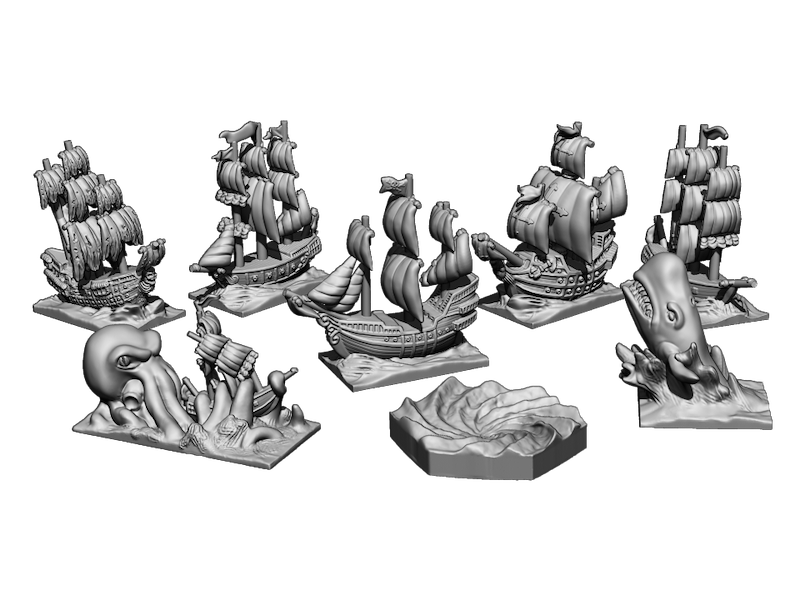 During the Voyage Phase you use a different board made up of hexagons, where you can also find enemy ships to board and sea monsters to fight. 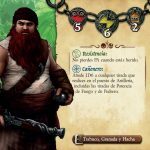 Your Captain will have taken on jobs on Tortuga Isle and it’s in this Phase where you can fulfill them to increase your fame and fortune! Finally, you will have the chance to rest and spend your money during the Port Phase. There are many places to go and several personalities to trade with who can also teach you new skills. 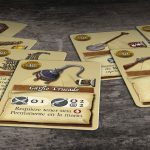 You will gamble your hard-earned booty, repair the ship, and listen out for interesting rumours. And it’s here where you can buy a nice pegleg to replace the leg you lost to the dreaded Darkclaw! 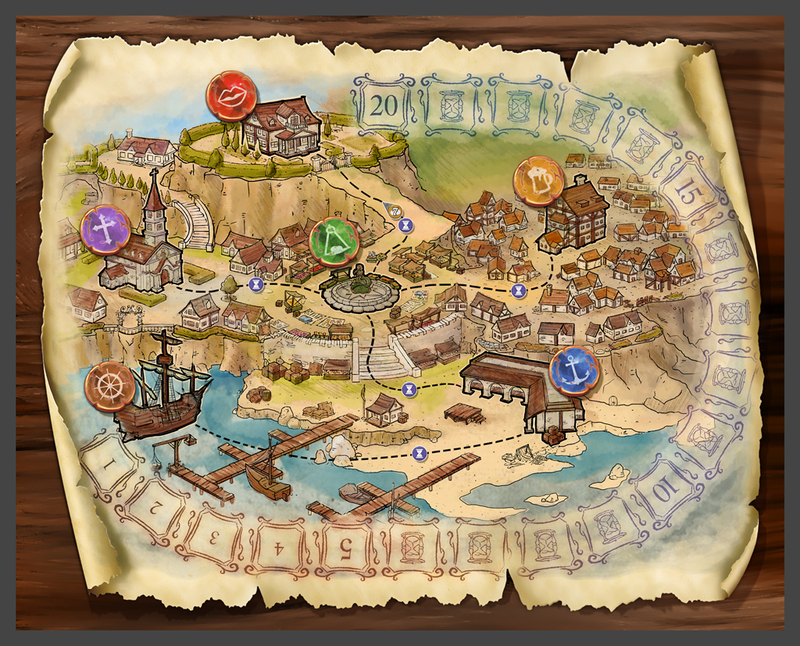 The Port is the place to restore health or acquire skills, equipment or rumours (which act as mini-quests for the next Adventure phase that grant rewards to the accomplishing player ), repair and/or equip the ship, and much more! 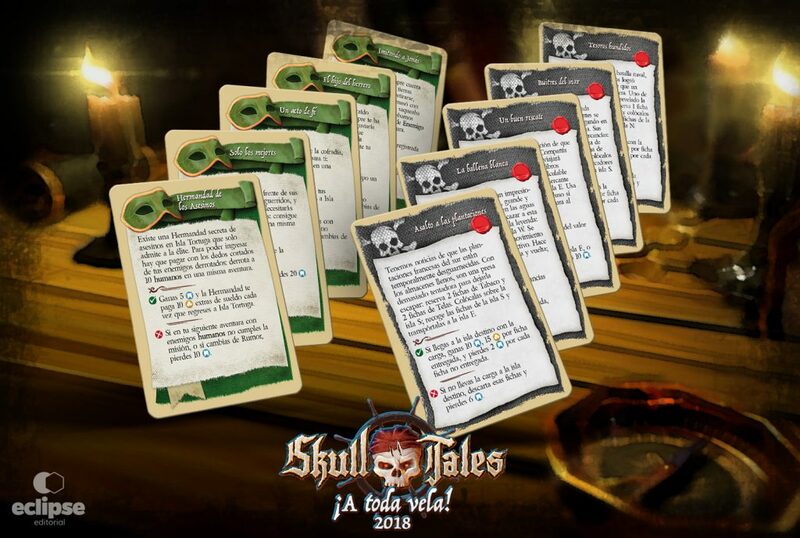 The actions you take in the Port Phase are measured in time units.Every player has a limited amount of these units and should therefore choose wisely how to spend it. 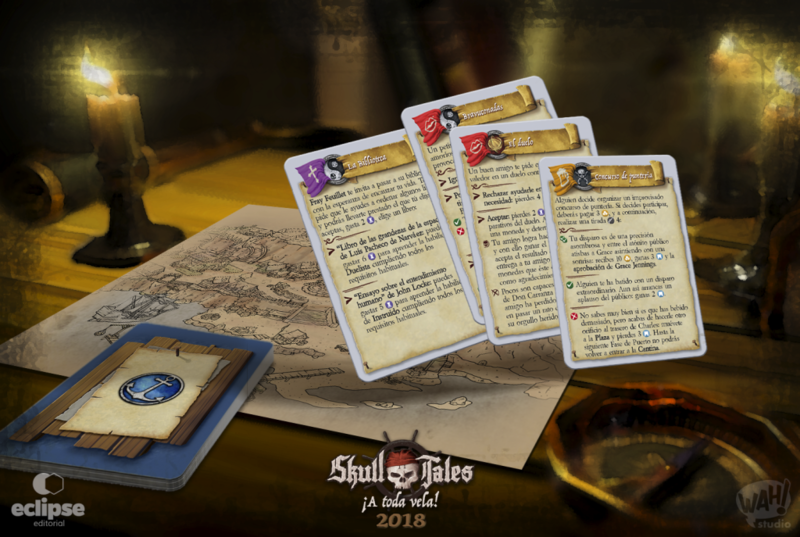 A variety of characters , enemies and equipment, the chance to play a single scenario or a full campaign, along with the exploration mechanics truly make Skull Tales: Full Sail! 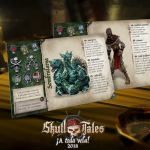 a game with high replayability that will guarantee endless hours of fun! All aboard, pirate, The Southern Lady is setting sail! 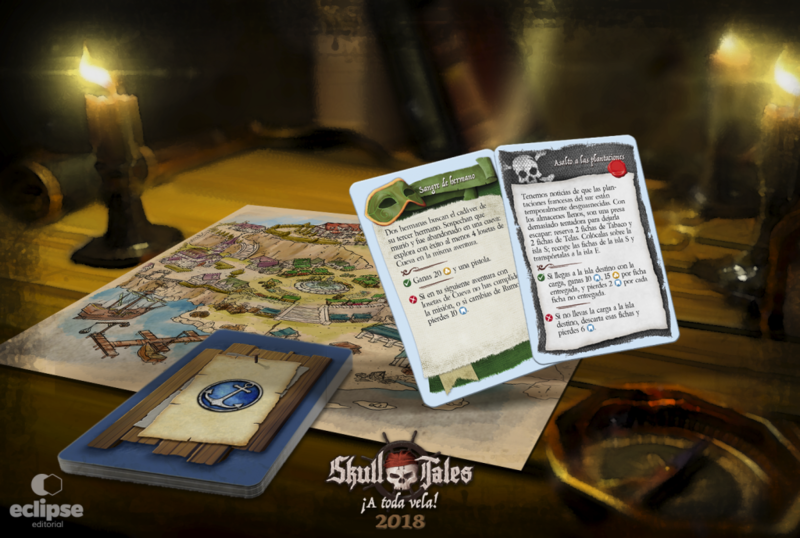 Skull Tales on BoardGameGeek (BGG) and la antigua versión. Full Chapter: about 150 min.